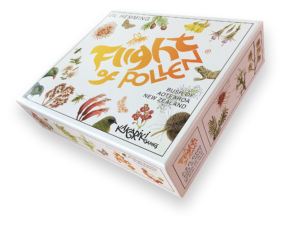 JiL has done some new videos on How to Play Flight of Pollen. There is a individual video for each level. View all the videos on this How to play video page. 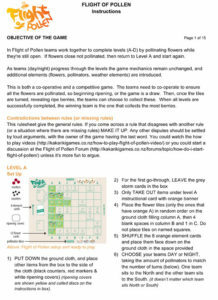 Here is a PDF you can download with detailed instructions on how to play Flight of Pollen. February was Meet-the-Providers month. Enviroschools in the Greater Wellington region invited teachers to meet with local providers of environmental resources. 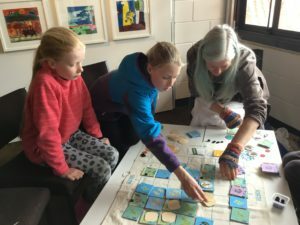 Because Cloak of Protection has had huge support from Wellington Enviroschools, I attended events in the Kapiti Coast, in the Hutt Valley, and in the Wairarapa. 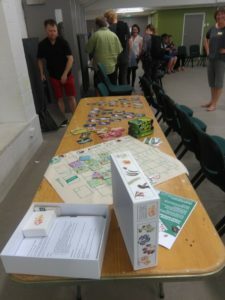 Many teachers were very complimentary about Cloak of Protection, and were keen to have a look at Flight of Pollen, and to learn our plans for teaching it. Here is a table of Kakariki Game goodies, laid out in Featherston. We’d love to see you under the Story Tree, says Tanya Batt, at Whakanewha Regional Park, for our January environmental storytelling programme. Tanya and her cohorts were testers for Flight of Pollen. I’ve just done a quick trip back to Waiheke Island to play the finished game with her. There I was treated like a queen – even sleeping in her big red story bus! 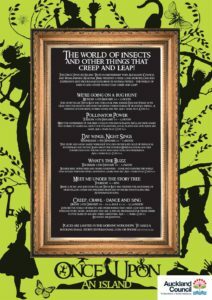 That’s the pollinator programme that will be under the story tree on Waiheke Island this January. Here’s a message just in, from one of the Flight of Pollen pledgers. Thank you so much for developing your beautiful game, Flight of Pollen. I played it for the first time on the 24th November with my colleague Leanne and her husband. 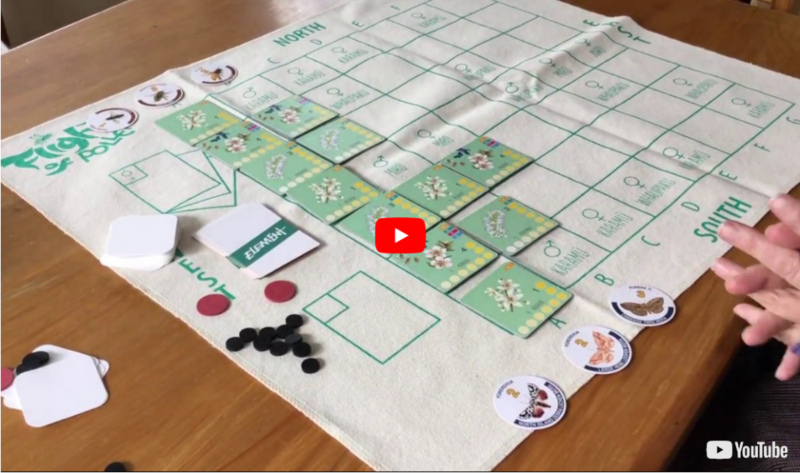 We had a lot of fun – though it took us a while to understand how to play! We found the videos quite helpful. Since then I’ve played it a second time with some children from Limehills School. Gosh! Kids catch on much quicker than adults! Amazing. Thank you for the new instructions. I’ve read them and I think they are very good. We will definitely play again and I’ll let you know how it goes. 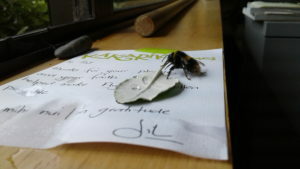 Today Leanne and I found an exhausted bumblebee on the ground outside our office. We took her inside and fed her some sugar water. We watched her drink the drops and celebrated as she gradually gained her strength, stretched her legs, groomed herself, wiggled her furry bottom, then flew out the window. Only afterwards did we realise that I had used your lovely note, delivered with the game, to rescue the little creature! Many thanks, JiL. I think you’ve created something quite wonderful. can be confusing if you’re expecting to start a turn by rolling a dice! Because there isn’t one. Instead, each round begins by turning over an element card. Here’s Shawn holding them up! Native bees come in three sizes. Small, very small and extremely small. Last summer I was with my friend Gretchen at their community garden in North East Valley, Dunedin. Little black native bees were everywhere! I followed them as the sucked on flax petals (they were after nectar not pollen), and clustered around cabbage tree flowers. Flighty and fly very fast, seldom settling on one flower for long. As I observed our short-tongued native bees are generally better at pollinating native flowers, while the introduced honeybees and bumblebees were busy in other parts of the garden, pollinating the crop flowers. The native bee is an important pollinator in Flight of Pollen, picking up and dropping off a load of three. In the game loads range from one (hoverfly) to eight (bat). Aotearoa / New Zealand has 28 species of native bees. Most native bees are solitary. At the end of summer they dig holes in the ground, and there they lay a single egg in each cell. These eggs hatch in spring and feed on the nectar and pollen left for them, before emerging. Quotes from Jay Iwasaki, a PhD student in the Departments of Botany and Zoology at the University of Otago. Flight of Pollen has finally arrived! And I’ve been busy dropping off pre-orders door-to-door. Big congratulations to the design team, and to Graphic Press, Levin. They’ve done the game proud. Meanwhile Stan is busy overlocking the ground-cloths and packing up the boxes. All go at his house! Taupo District Library. SATURDAY Oct 28, 1-3.30pm. 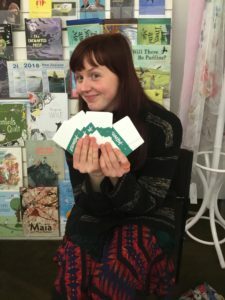 If you’re in the area, please come play both my New Zealand environmental board games with me. 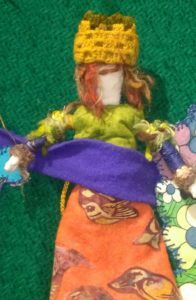 This is part of the Playing in Paradise exhibition in the Niven Room, at the Taupo Musuem, running Saturday 27 October – Monday 4 December. On display are artworks from Jane Penton, Laura Sue Bailey, Kanai Cowell and some of my early paper works and bird images. Nearly five years ago Kapanui School students in Matt Wynne’s class helped make the how-to-play video for Cloak of Protection. In the meantime a strong bond has been formed between myself and Wellington Enviroschools. So when Flight of Pollen was nearly finished I, along with the local Enviroschools facilitator Amanda Dobson, returned to Matt Wynne’s class to make another video. Making a video was different this time because the game was still in development. Class sessions were held, and students practiced the game. But watching the video is also watching seven students learn and play. It is to observe teams become more strategic as they move up each of the four levels. The video was filmed and edited Paul Britten-Morby, Kaost Graphics. As he knew the students they were very relaxed about being filmed. And the ending has a surprise twist where, at their suggestion, a rule-change to the game is allowed. Then Flight of Pollen was launched at the Mahara Gallery on Saturday 2nd September. Once again Matt’s Kapanui students were present, this time time to demonstrate and teach the game. Here also, the videos were played for the first time. The plan is that students from this class, using Nga Manu as a base, will also teach the game to students at other schools. So carrying Flight of Pollen along.